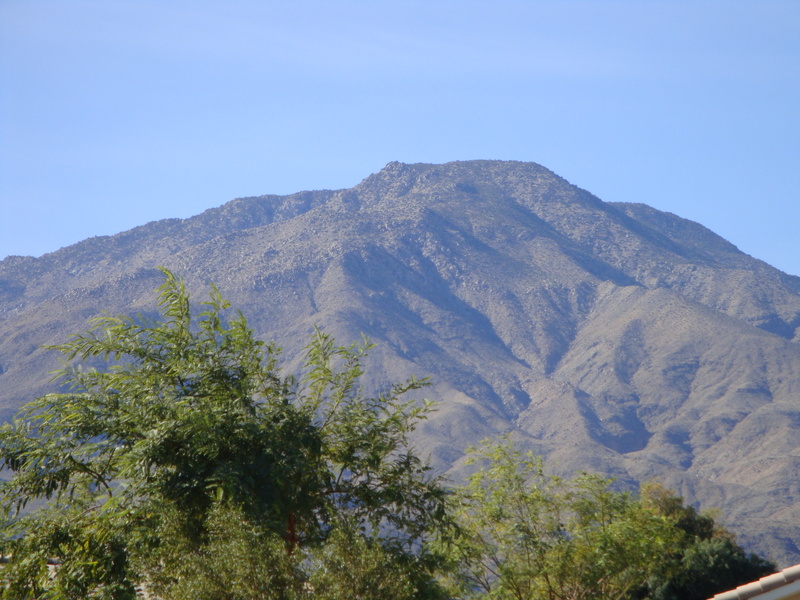 The Santa Rosa Mountains near my desert home rise from the valley floor, unannounced by rolling foothills or slowly increasing elevation. They spring jagged, rugged and breath-taking from the flat arid land at their base. Their command is complete over part of southern California’s Coachella Valley. Each evening, the sun descends behind this rugged Santa Rosa Range. At a certain moment, when the mountains are backlit, the sky is illuminated in pale blues and warm beiges, reminding me of skies in the work of artist R.C. Gorman. Then, slowly, the sun continues its journey and the outline of the Santa Rosas disappears. Night arrives, bringing quiet, darkness, starlit skies. Peace. Once upon a time, this desert land was beneath an ancient lake. Over the years, the water receded and disappeared. It left its waterline along the mountainous base, a dark and steady mark, forty feet above the desert floor. In the sand remain pieces of mollusks and other water life. I forever marvel that I live in a desert once covered by a large body of water; that this desert-scape continues to lure and inspire me. That over time its spiritual essence has captivated me. I find the attraction strange because my childhood was spent near water. The Great Lakes of Erie and Ontario. By Ellicott Creek, the Niagara River, Niagara Falls. It was spent near old rolling hills, eroded by time and weather. Near outcrops of cold, hard granite, the Niagara Gorge and the Niagara Escarpment. I walked in the rain. I played in the snow. How odd I now am lured by shifting sand and young, rugged mountains. Through the course of a day as the sun moves across the sky or a cloudy gloomy day descends, shadows slide into the mountainous crags and canyons bringing with them shades of purples or browns or grays. Sometimes the mountains hide in haze. More often their surfaces bask in the sun, brightly lit, the rocks and sharp edges finely etched. I ponder the contrasts of the desert land, feeling I want to reach into the thousands of years that surround me. I’m reminded of how life continues, of the eons of time behind me, of the eons of time that will come after me. For a moment I feel insignificant in the world’s grand scheme. In the next I feel happy to be a part of this mysterious universe. Then in the next, I feel full of life, blessed by my very existence, grateful for a passion and desire to create. To write. I seek the ideas inside me, can feel myself reaching for them. I’m forever thankful for the land. For the inspiration. For the peace where I can listen … and hear my thoughts. 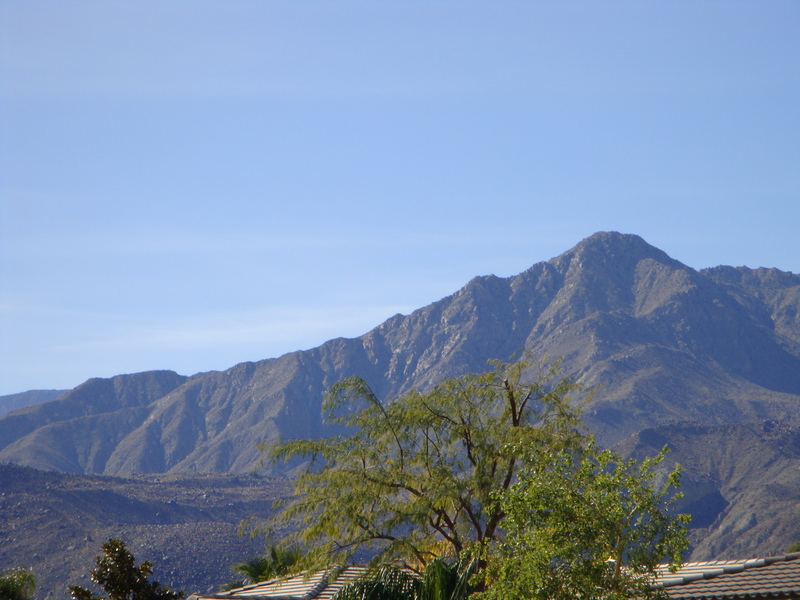 This entry was posted in Creativity, Inspiration, Looking for Inspiration, Writing and tagged Coachella Valley, desert, peace, Santa Rosa Mountains. Bookmark the permalink. I’ll miss you when I leave next week. Thank you! Keep the spirit of the mountains close. Safe journey. Let’s keep catching the beautiful moments … as you have in your art. Carol– I so enjoyed reading about YOUR desert; you have a lovely way with words. And I truly enjoyed reading what you had to say. I wish I had your talent and discipline to get the job done! Thank you for your kind words. I’ll try not to disappoint! Lovely, Carol. I look at those mountains so often, marveling at their unique beauty. You have captured exactly how I feel but could never put into words. Feelings are hard to capture. Thank you! Carol, I have lived in both your worlds. You write like a painter. Wonderful to hear from you. Thank you! I value your thoughts. I wish you and your art still visited my desert world every year! How much fun – your prose is beautiful, Carol. Looking forward to each post. Beautiful. You have written what I feel. Thank you. Carol, fine feeling, gorgeous writing–I feel the same beauty from the Santa Rosas, watching them as they change throughout the day. Aren’t we lucky to live here! Yes …the beautiful and ever-changing Santa Rosas! Thank you, Jenny. “Kiss ’em and halo ’em.” Love it! Glad you stopped by … Thank you. Thank you, Carol for the invitation to share your excellent website. Inspiration and creativity. Writers’ workshop. All subjects of interest to me. I can’t wait to tell other family members to bookmark your site. I am personally delighted. I would love to be a student in your classroom. And now I can do just that. So happy you stopped by! Glad you find the posts meaningful … Thank you! I second Carole Thomas’ comment. And, your students are so lucky! Thoughtful writing. I’m enjoying your blogs. Thank you for taking a moment to drop in. Glad you enjoyed. Success with your upcoming book and new blog. Your writing speaks to the inspiration we carry within but often fail to understand. Gifted writers see with an inner eye and reveal the splendor for others cannot express with words..
Lovely comment. I like the inner eye, and then to dig and feel deeply. Thank you, Jim.